Be whisked away by limousine along one of the most scenic roads in California during this full-day tour from the San Francisco Bay Area. Cruise along the coast-hugging Highway 1 past sea cliffs and windswept cypress trees, and glimpse the coastal mansions of Pebble Beach on the iconic 17-Mile Drive. You'll have free time to explore Monterey's Cannery Row and the boutiques of Carmel-by-the-Sea on this private excursion. Pricing is per group, based on a maximum of six people. Escape the San Francisco Bay Area for a 10-hour day trip to the Monterey Peninsula via the Pacific Coast Highway, which features stunning seascape views. Then travel along 17-Mile Drive heading to the coastal town of Carmel-by-the-Sea. After hotel pickup, settle into the comfort of your private vehicle while a professional chauffeur takes you to Monterey. On arrival, stop at historic Cannery Row — John Steinbeck’s novel of the same name takes place on this street during the Great Depression. If you'd like, visit Monterey Bay Aquarium to see more than 30,000 underwater creatures, from sea otters to sharks and the rare and massive ocean sunfish (admission is your own expense). 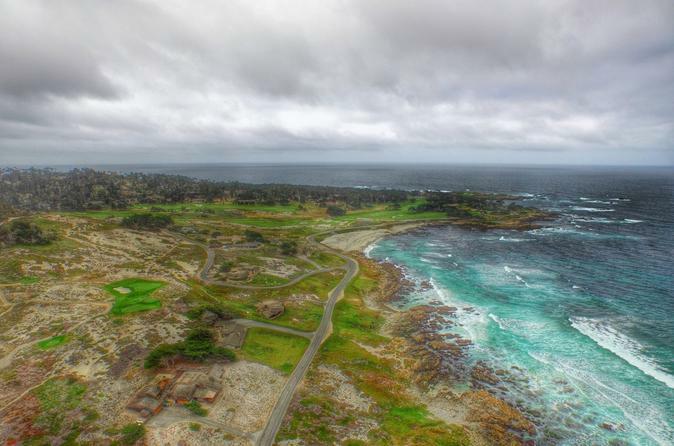 Then cruise down 17-Mile Drive, home to the world-renowned Pebble Beach Golf Course. Admire the Lone Cypress, a postcard-worthy tree that stands on a rugged granite outpost above the waves, and scope out the area’s magnificent mansions with their sweeping coastal views. Stop along the way to snap photos of the seals basking in the sun on the aptly-named Seal Rock. Finally, head to enchanting Carmel, whose charming downtown shopping district, beautiful beaches, and historical mission make this one of the most beloved destinations along the coast. Spend some time popping into unique boutiques and art galleries before returning to San Francisco via Silicon Valley, where you'll get a glimpse of its tech campuses.